A 30-member group of Afghan parliamentarians led by Syed Ishaq Jilani was invited to an exclusive dinner meeting hosted here by Mr. Iftikhar Ali Malik, Vice-President SAARC Chamber of Commerce and Industry in collaboration with the PPP Senator Jahangir Bader. Afghan parliamentarians have offered Pakistani business community to invest in the reconstruction phase of Afghanistan and extend technical assistance in the areas of mutual interest to enhance economic cooperation. Engr Abdul Ghaffar, Afghan MP said that the Pakistan had always helped Afghanistan in the time of need, particularly providing shelter to the Afghan refugees. He observed that the effective implementation of the Afghan Transit Trade Agreement would help promote economic cooperation between two countries. Mr. Tariq Sayeed, Vice Chairmain, Confederation of Asia Pacific Chamber of Commerce and Industry assured the delegates that Pakistan`s private sector would request their government for implementing the ATTA in letter and spirit, which would ultimately channelise legal trade. He also requested the MPs to integrate Afghanistan Chamber of Commerce and Industry as a member of SAARC chamber. Mr. Iftikhar Malik said that Afghanistan had been serving as one of the oldest trade routes connecting Central Asia with Persia and South Asia. Both countries have since long been enjoying amicable relations and the Afghanistan affiliation with Saarc chamber would help in economic development of the country. Another Afghan MP Ms Hellay Arshad thanked the business community of Pakistan and the SAARC Chamber of Commerce & Industry for hosting the delegation. Senator Ghulam Ali, President, FPCCI stressed the need for enhancing bilateral trade between Pakistan and Afghanistan, and requested the Kabul government to also involve Pakistani enterprises in reconstruction phase of the country. The bilateral trade between two countries is estimated at $1.3 billion and the balance is in favour of Pakistan with exports at $1.2 billion. 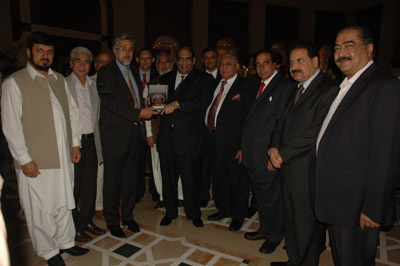 The dinner was attended by more than 50 prominent business leaders and the senior government officials.